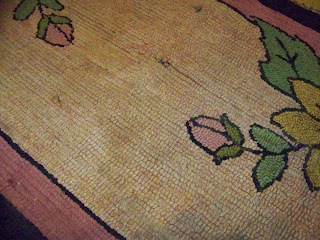 I had the surprising good fortune to win two Ebay auctions for antique hooked rugs. 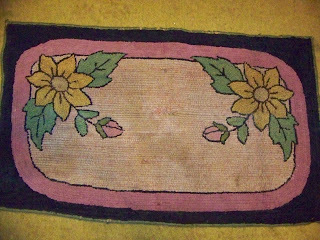 The rugs aren't in perfect condition, but I like to look at the work of the old hookers - especially the hookers who made rugs intended to be used. The rug in the first three pictures is in good shape everywhere except down the center line. It doesn't show in the photo, but there are two rows right in the center where the burlap is worn out. The whipping was done with a very thin yarn, almost just a wool thread, and it completely covers the edge of the burlap - I'm only assuming the backing is burlap, I haven't really checked yet. I took this photo to show the thin whipping thread, but now I'm intrigued with the way the black hooking made such a perfect corner. It almost looks like different people hooked different parts, since the pink is hooked so much tighter than the black, and then the gold looks like a different hooking style altogether. 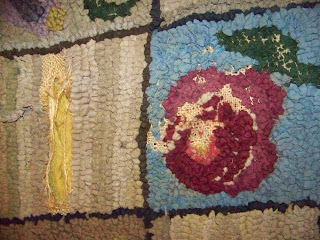 If you draw an imaginary line between the rose buds, then find it's center and move about an inch to the right, you can see the strip where the hooking is gone and the burlap is worn out. The pattern and the choice of colors looks like what I think of as a dimestore kit - I don't know why I call them that since I never saw a hooked rug kit in a dimestore, but that's where I think they would have been sold. I suppose I'm showing my age by even remembering dime stores. The second rug is much larger than the first, it's as wide as the first one is long. It's also much more worn than the first one. 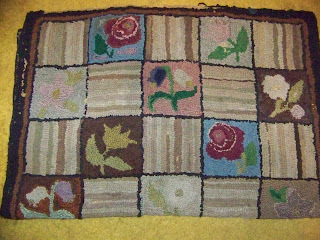 It seems like a rug that was really cared about, it has already been mended in quite a few places. 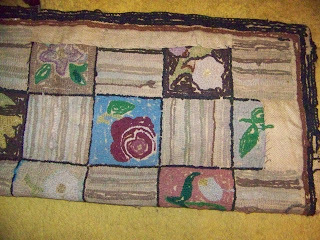 There is burlap added on the back and there are places where new hooking was added. This is half of the rug, and it looks pretty good, although I suspect the burlap is having a hard time holding the weight of the rug when it isn't placed on the floor. You can see the patches in this photo. 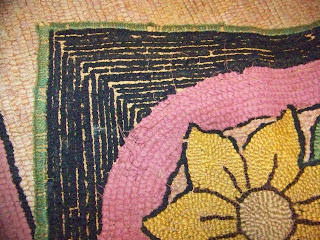 The patches are all around the edges, although the outer edge hasn't shredded the way many old rugs have. Here are the two spots that are in the worst condition. I suppose they could be mended the same way the other places have been repaired. I might someday do the repair, but if I do, I will probably put some muslin or canvas all over the back to try to support the weight of the rug. I probably won't put the rugs on the floor - when I did put them down to look at them, I had to fight off two dogs who were determined to claim the rugs as their own. I'm sure the burlap on the largest one is not going to survive the pressure of dogs rolling, or even walking on it. 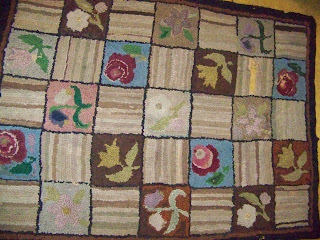 I really enjoy looking at these rugs and wondering who hooked them and where they were placed for so many years. There are no hints like worn pathways or protected areas on either rug to indicate that they were placed in or out of a traffic pattern. They both look like they have been walked on a lot, especially the large one. The large one seems to have been made with a variety of fabrics, the smaller one looks like all wool strips, although at first I thought some of the colors might have been hooked with yarn.